Alexander Bagonza, better known by his stage name A Pass, is quietly becoming one of the biggest big-mouth artists in Ugandan music industry. Recently, he took to social media and claimed he is the best musician Uganda has ever seen….as if it was enough, a few days ago he again took to social media and claimed he is the reason why some artists like Navio have run into Kadongokamu. Well not everyone is happy about it. 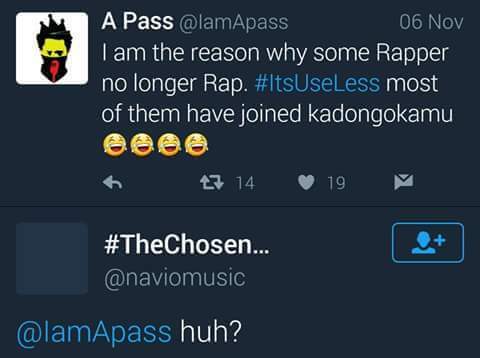 Navio actually came out with a response that leaves a lot of imagination. Meanwhile, Howwe.Biz has learned that there are whispers around Hip-hop community that they will discipline A Pass in the most possible way. We don’t know much about MUSIC POLITICS – we just want to see how this will end! !